Earlier this week I posted the before and after of the Fresh & Modern High Gloss Credenza with Geometric Drawers. I’m so thankful for all of the positive responses and comments I have been getting from people on that piece. Be sure to go check out the reveal if you haven’t already! Pieces like this are always great because they can be used as dressers, media consoles and changing tables (or more! ), and the white and walnut look is just so classy. Since it’s neutral in color it can be staged and decorated with different types of decor. I started off with a blank white canvas and a tall blue map of New York to add some height. While staging I wanted a natural modern look so I used lots of greens and plants to bring in some color. The plants also help to add texture and the varying heights are great to balance out the other items. The long concrete planter fills in the center of the console without blocking the map art. I had to use in the blue glass head I recently purchased at Ross for $8.99 to add something funky, and then I added an adjustable chrome arm lamp on the left to balance out the vase of greens on the right, but also because I love the shape it brings in. While staging the the piece I filmed a little video to you show you how it all came together. Just for fun 🙂 It’s sped up and condensed into a 30 second video. Sources for all staging items below. Reeves, I have always loved the staging you have done with your pieces. Amazing! Great post admin. I also love it. 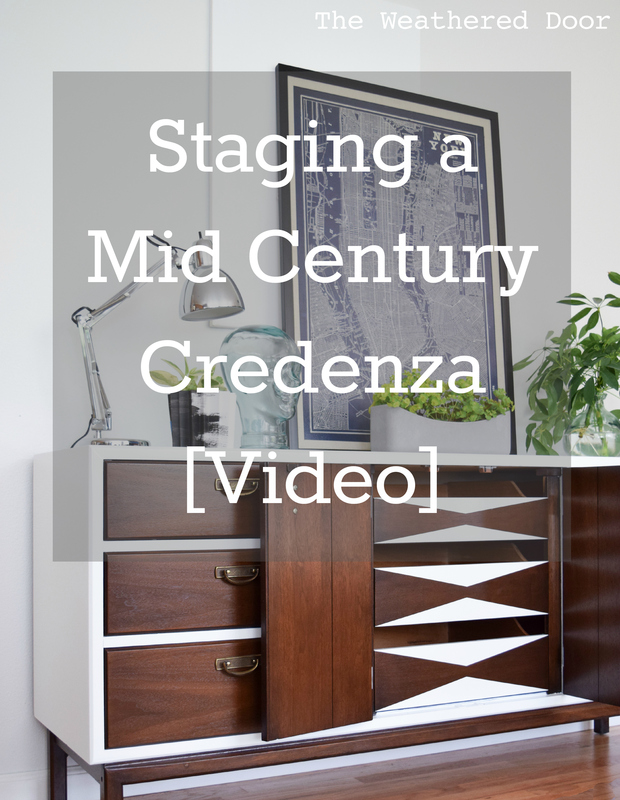 I read your article to gain more knowledge about mid-century. Thanks for this nice posting.